The top three in the market look a cut above the rest in this. Our Conor represents Ireland and has a tall reputation. He beat a couple of good horses at Fairyhouse in a grade 3 and then beat Diakali in a Grade 1 at Leopardstown. That sets the standard. Far West has got valuable course winning form but it doesn't look quite up to the level of Our Conor. Rolling Star beat the smart Irish Saint last time who followed up in a Grade 2 at Kempton. Cases can be made for all three but Our Conor may be a bit special. What a great performance from Our Conor. Cruised to the lead. I actually used my William Hill C50 match bet on this tip and won £200. So it proves what these free bets are worth. Excellent tip from Sean. Brilliant. Cotton Mill is an easy selection for me in this. Raised five pounds for his second to My Tent or Yours in the Betfair Hurdle he should have the class to see this through. I'll be disappointed if he doesn't put in a bold show. Bryan Cooper is in flying form. Brilliant to see the young Irish jockey making a name for himself. Quite amazing. At Fishers Cross has valuable course winning form beating the very useful The New One and Coneygree last time. That sets the standard and his main opponent in Ballycasey who's untried at this slightly longer trip. At Fishers Cross has the form in the bag and can outstay them all up the hill. Great win for McCoy, traveled well, and At Fisher's Cross ran off up the hill. Great tip from Sean Kelsey who gave this horse to me earlier in the week at 9/2. The highs and lows of racing with J T McNamara injured and thoughts of Campbell Gillies. Poignant words from McCoy. A fascinating renewal of the Gold Cup. Bobs Worth probably sets the standard on his win in the Hennessey. Not seen since then he goes well when fresh and is unbeaten in four runs at the track. That counts for a lot but one thing the pundits appear to have missed is that he's never run on soft ground let alone won on it. This may be a coincidence of course but it does prevent me backing him with confidence if it is still really soft on Friday. Sir Des Champs has another great record at the track (unbeaten in two) but has beaten twice this year. One of my favourite horses, I've never really thought of him as being quite good enough to win a Gold Cup. Long Run will attempt to win back his crown. He's stepped up on his form last season and showed great resolve in getting up to win the King George at Kempton. 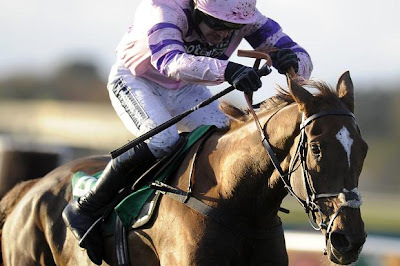 Soundly beaten by Silviniaco Conti at Haydock I'd be surprised if he reverses that form. Silviniaco Conti is an improving horse and won easily last time at Newbury. He's never won at Cheltenham but was placed in a (very good) hurdles race and I don't have any concerns that he won't act on the track. Silviniaco Conti was going well when falling three out. Great finish from the little terrier Bobs Worth. A superb winner. A hunter chase with amateur riders. No bet for me. Salsify wins but what cruel luck for Oscar Delta and Jane Mangan. How sad for the youngster to be denied what looked to be a winning ride. Too many runners still entered and very difficult however I have backed Barbatos in case he's goes here instead of the Coral Cup. A two mile handicap chase that Nicky Henderson will be keen to win. If the ground dries out a bit by Friday I'd be interested in French Opera at around 25/1. He's seems to have held his form and has been dropped a few pounds by the handicapper. He has a good record at the track and looks a little overpriced. I would like to thank our guest blogger, Sean Kelsey, for his great posts. Much appreciated.